exPress-o: Yay! It's Wednesday Cake! Let your hair down... and drunk! Happy cake day, are you ready to treat yourself today? If you’re a New Yorker or you’ve been to the city a couple of times, you're probably familiar with the phenomenal Union Square Breads Bakery, aren’t you? This place is what bread dreams are made of. Not to mention this is the ‘it’ spot to get the best babka in New York! Yes, the best of the best, really - ask New York Magazine if you don't believe me! The recipe is by Uri Scheft from his Breaking Breads cookbook. If you happen to own it, you probably know how amazing it is, if you don’t, get it, your life will change forever! Although this babka requires a big chunk of your time, but when it's finished, it lasts for days, making your midday coffee breaks so incredibly satisfying. Totally worth it! Make the dough: Whisk the vanilla into the milk in the bowl of a stand mixer fitted with the dough hook. Use a fork or your fingers to lightly mix the yeast into the milk. Then, in this order, add the flours, eggs, sugar, salt, and finally the butter in small pinches. Mix on the lowest speed, stopping the mixer to scrape down the sides and bottom of the bowl as needed, and to pull the dough off the hook as it accumulates there and break it apart so it mixes evenly, until the dough is well combined, about 2 minutes. If the dough is very dry, add more milk, 1 tablespoon at a time; if the dough looks wet, add more all-purpose flour, 1 tablespoon at a time, until the dough comes together. Increase the mixer speed to medium, and mix until the dough is smooth and has good elasticity, 4 minutes. Stretch and fold the dough: Lightly dust your work surface with flour and turn the dough out on top; lightly dust the top of the dough and the interior of a large bowl with flour. Grab the top portion of the dough and stretch it away from you, tearing the dough. Then fold it on top of the middle of the dough. Give the dough a quarter turn and repeat the stretch, tear, and fold. Continue to do this until you can stretch a small piece of dough very thin without it tearing, about 5 minutes. Then use your hands to push and pull the dough against the work surface and in a circular motion to create a nice round of dough. Set the ball in the floured bowl, cover the bowl with plastic wrap, and set it aside at room temperature for 30 minutes. Chill the dough: Set the dough on a piece of plastic wrap and press it into a 1-inch-thick rectangle. Wrap the dough in plastic wrap and refrigerate it for at least 1 hour or up to 24 hours before proceeding. Lightly coat 2 standard loaf pans with room-temperature unsalted butter. Roll the chilled dough: Unwrap the cold babka dough and set it on a lightly floured work surface (or on a long dining table - you need at least 4 feet of work space). Roll the dough into a 9-by-24-inch rectangle (it should be just a little shy of 1/4-inch thick) with a long side facing you. Pull and shape the corners into a rectangle shape. Fill and roll the dough: Spread the Nutella in an even layer over the dough, all the way to the edges. Then sprinkle the chocolate chips in an even layer over the Nutella, across the entire surface of the dough. Working from the top edge, roll the dough into a tight cylinder. As you roll it, push and pull the cylinder a little to make it even tighter. Then, holding the cylinder at the ends, lift and stretch it slightly to make it even tighter and longer. Twist the strips into a babka: Use a bread knife to slice the cylinder in half lengthwise so you have 2 long pieces, and set them with the chocolate layers exposed. Divide the pieces crosswise in half, creating 4 equal-length strips. Overlap one strip on top of another to make an X, making sure the exposed chocolate part of the dough faces up; then twist the ends together like the threads on a screw so you have at least 2 twists on each side of the X. Repeat with the other two pieces. 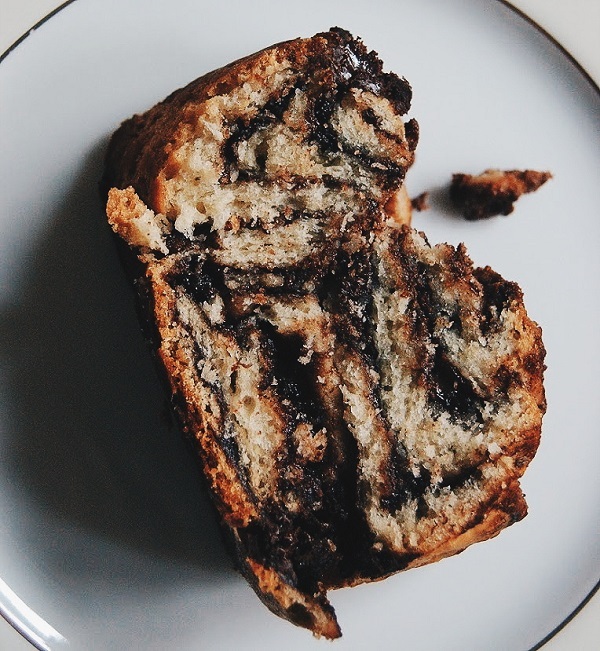 Place each shaped babka into a prepared loaf pan, exposed chocolate–side up. The dough should fill the pan by two-thirds and fit the length perfectly. Cover the pan with plastic wrap and repeat with the other pieces of dough. Let the dough rise: Set the loaf pans aside in a warm, draft-free spot until the dough rises 1 to 2 inches above the rim of the pan and is very soft and jiggly to the touch, 2 to 3 hours, depending on how warm your room is. Bake the babkas: Place the babkas in the oven and bake until they are dark brown and baked through, about 40 minutes; check them after 25 minutes, and if they are getting too dark, tent them loosely with a piece of parchment paper or aluminum foil. Meanwhile, make the simple syrup: Combine the sugar and water in a small saucepan and bring to a boil over high heat. Reduce the heat to medium-low and simmer, stirring occasionally to dissolve the sugar. Turn off the heat and set aside the syrup to cool. Brush with simple syrup: Remove the babkas from the oven, and while they are still hot, brush the surface generously with the cooled sugar syrup (the syrup makes the top of the babkas shiny and beautiful and also locks in the moisture so the cake doesn’t dry out). 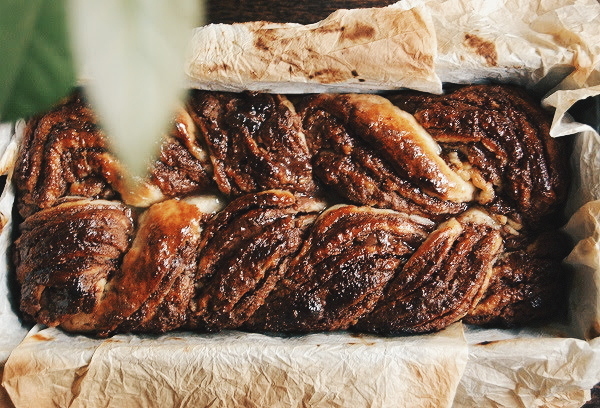 Use a paring knife to separate the babkas from the pan edges, and turn them out from the pan. Slice and serve warm, or cool completely in the pans before unmolding and slicing. Ta-dah! P.P.S: Love pears? Try this!